The basic #119 is the un-retouched dry printing. Period. This must mean that any wet printing not falling under the sage green or grey green groups is automatically classified as dark olive green, which is the second cheapest shade. So even though Unitrade places a vague 1912 date next to this shade group, the reality is that it covers the entire period from 1912-1922. The sage green is not dated, but my observation is that it generally covers the period from 1915 to about 1918. The grey-green is the first printing from January 23, 1912. So it must have the paper and gum characteristics of the 1912 printings. These are a clear, but yellowish shiny gum, and a paper that shows coarse or fine vertical mesh, as well as perforations that can appear a bit rough. The problem with the shade names in Unitrade is that neither the sage green, nor the grey-green are true to the sage-green or grey-green colour swatches in the Stanley Gibbons Colour Key. In relative terms, when compared to the other stamps, they clearly do appear sagey and greyish, but I see a lot of stamps from the grey-green printings being misidntified as the cheaper dark olive green, when they need not be. This post, in keeping with all my other posts on this topic will show you examples of each Unitrade listed shade, and will then cross-reference these shades with the Stanley Gibbons Colour Key names, modified as necessary when a shade has black or white added, or is paler or deeper than the swatch. These two stamps are both dry printings without the re-touched frameline. They are listed in Unitrade as being olive-green. However, neither one is a pure olive green. 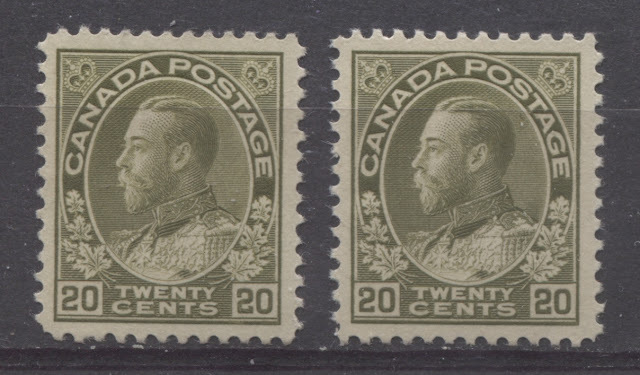 As a matter of fact, both are greyish olive in Gibbons Colour Key, with the stamp on the left being paler than the one on the right. Light yellow olive - similar to yellow olive, but with a hint of white added to the colour. Brownish olive green - similar to the olive green swatch, but with brown added. Pale brown olive - similar to the brown-olive swatch but much less intense. Yellowish olive green - similar to the olive-green swatch, but with yellow added. Deep brownish olive green - similar to the first stamp, but deeper. Deep brown olive - similar to brown olive but much deeper. Deep brown olive - almost identical to the first stamp. These shades are very distinct compared to the others. However, it is easy to see how a collector who had not seen the other shades and was trying to identify the stamps using the Unitrade shade names could mistake these for the more common dark olive green. Light yellow olive - Unitrade's sage green. Brownish olive green - Unitrade's dark olive green. Deep brown olive - Unitrade's grey-green. If you compare the first image with the third image, you will see that the colours look similar with the third image being darker. This is consistent with Unitrade's classification as olive-green and dark olive green respectively. The fourth image does not look like olive green at all, and is greyish, which is why Unitrade calls it grey-green. The tricky colour here is the sage green in the second image, which at first glance looks similar to the dark olive green. What gives it away though is the almost complete lack of brown in the colour, being very yellowish in comparison. 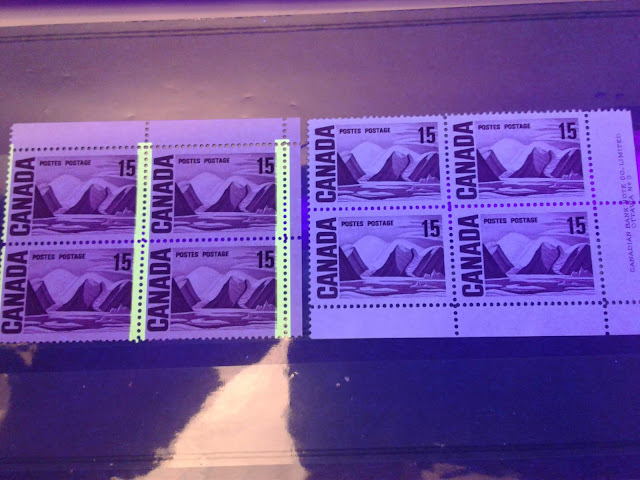 I find that a good way to spot this shade on mint stamps is to look for paper that shows almost no mesh, and for gum that is yellowish cream in colour, and shiny, but without any texture to it. The earlier 1912-1914 gums often have a streakiness, or are clear and allow the mesh of the paper to be visible, while the later post 1918 gum is usually a creamier colour and has a slightly textured look, as paint would appear when applied to a wall with a roller. This concludes my discussion of the shades of the 20c olive green Admiral stamp. All that remains now to complete the discussion of shades is the 50c and the $1, which I will cover in my next posts. Once I have finished dealing with the shades, I will discuss other aspects of this issue, starting with paper and gum, as well as some more general posts about collecting in general to give a break from highly technical stuff.